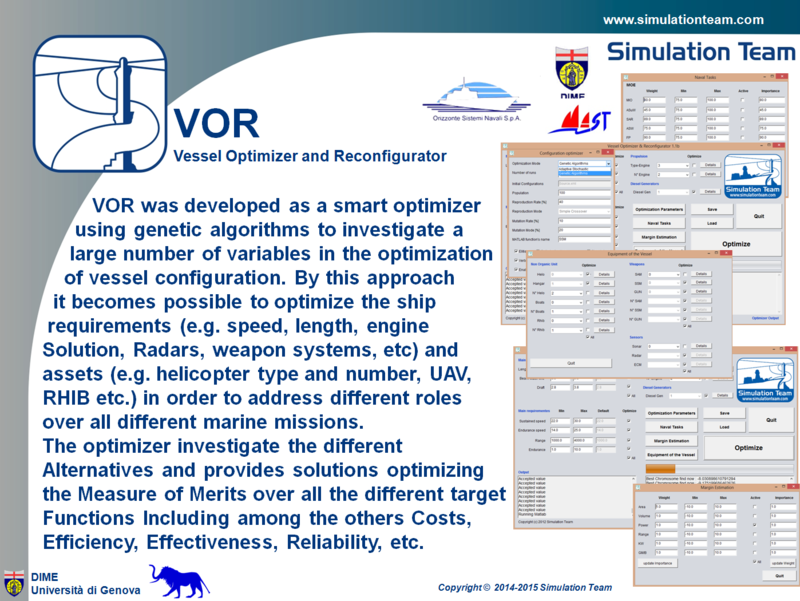 VOR was developed as a smart optimizer using genetic algorithms to investigate a large number of variables in the optimization of vessel configuration. By this approach it becomes possible to optimize the ship requirements (e.g. speed, length, engine Solution, Radars, weapon systems, etc) and assets (e.g. helicopter type and number, UAV, RHIB etc.) in order to address different roles over all different marine missions. The optimizer investigate the different Alternatives and provides solutions optimizing the Measure of Merits over all the different target Functions Including among the others Costs, Efficiency, Effectiveness, Reliability, etc.